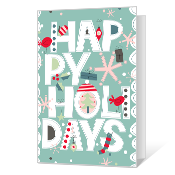 Cover Verse: A Holiday Wish for You Inside Verse: Hope your holiday is as special as you are! 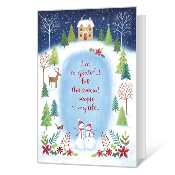 Cover Verse: Happy Holidays Inside Verse: The nicest part of the season is remembering special people like you. Cover Verse: From home to home and heart to heart... 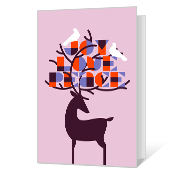 Inside Verse: With warmest wishes for this holiday season and always. 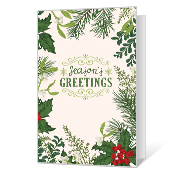 Cover Verse: Season's Greetings Inside Verse: ...and good wishes for the New Year. 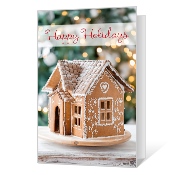 Cover Verse: Happy Holidays Inside Verse: Hope your holidays are merry and fill your heart with cheer, And bring you lots of happiness throughout the coming year! 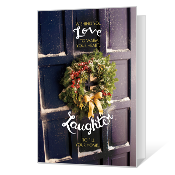 Cover Verse: Wishing you love to warm your heart, laughter to fill your home... Inside Verse: and light to shine all through your season. Wishing you the kind of holiday memories are made of. 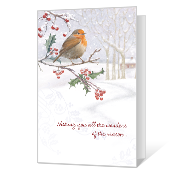 Cover Verse: Wishing you all the wonders of the season... Inside Verse: and beautiful new memories to carry with you throughout the coming year. 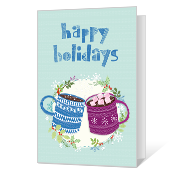 Cover Verse: Happy Holidays Inside Verse: Hope happiness fills your holidays in many warm and special ways. 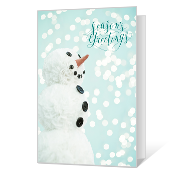 Cover Verse: Season's Greetings This comes with special wishes when the holidays are here... 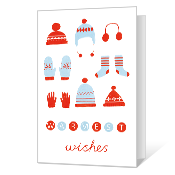 Inside Verse: Wishes for a season filled with laughter, warmth and cheer, And wishes for your happiness throughout the brand-new year. 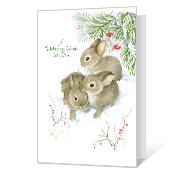 Cover Verse: Joy Love Peace Inside Verse: Wishing you all of these at the holidays and in the coming year. 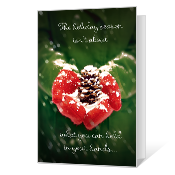 Cover Verse: The holiday season isn't about what you can hold in your hands... Inside Verse: It's about what you hold in your heart. 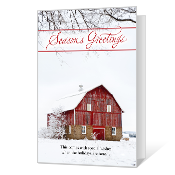 Wishing you a wonderful season. 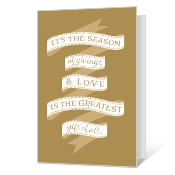 Cover Verse: It's the season of giving...& love is the greatest gift of all. Inside Verse: At the holidays and all through the year, thank you for all the ways you touch my life with your giving, your caring, and your love. 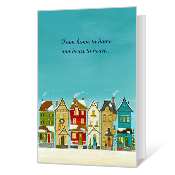 Cover Verse: Warmest Wishes Inside Verse: ...for laughter and love and joy everywhere, For a circle of friends and good times to share, For a house full of fun and a heart full of cheer, And the best times ahead for a happy new year!